FREE Omaha Steaks with purchase of EVO Grill. For a limited time only, receive a FREE Omaha Steak Gift Certificate with purchase of any Evo Grill! ($175 value). This Evo Professional Classic Tabletop Grill is the perfect solution for entertaining your family and friends. Its the first outdoor BBQ grill that allows you to cook directly and indirectly at the same time. If you are cooking directly, you can sear, saute, grill, toast and stir-fry. Indirectly, you can boil, braise, poach or fry. And by covering the cooking surface with its stainless steel hood, the Evo Professional grill becomes a patio oven for roasting, steaming, warming or smoking. No other grill lets you be this creative outdoors. This Evo Professional Tabletop Outdoor Grill features a cooking surface that is 30 inches in diameter and 650 sq. Inches total. 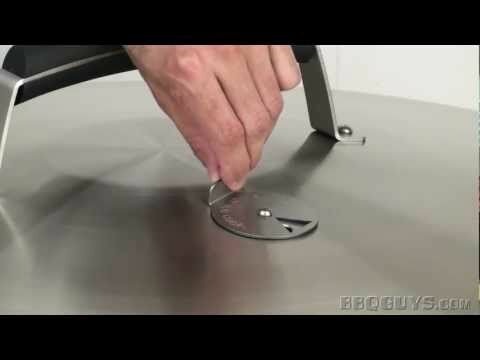 The enclosed stainless steel circular burner system ranges from 250 to 700 degrees, produces a total of 48,000 BTUs from the center to the outside for edge to edge heat control (burner operates from a single control knob). The grill comes with a heavy duty stainless steel frame along with a stylish hood that has an adjustable vent. Also, this Evo Professional Tabletop Cooktop has an easy start up electronic (battery operated) spark ignition that allows you to light one or both burners simultaneously, a stainless steel drip pan around the cooking surface that catches any spillovers from falling, and a removable waste tray that is dishwasher safe. This is one of the easiest grills to clean and maintain, simply scrape and wipe down the surface and it looks brand new. From a delicious pancake and bacon breakfast to the juiciest seared steaks that you have ever tasted, this Evo Professional Tabletop grill can do it all. Cooking Grid Dimensions 30 X 30"
What is a Hibachi Grill? The limited lifetime warranty on the Evo Grill states the grill shall be free from rust-through on all metal surfaces and shall be free from defects in materials and workmanship under normal and reasonable use from the original date of purchase. The 1 year warranty applies to all electronic components, gas components, accessories, and repair parts including, but not limited to, electronic displays, overlay and membrane switches, temperature sensors, hot surface igniters, computers, transformers, heater elements, relays, igniters, ignition controllers, wiring, switches, encoders, outlets and plugs, gas regulator, gas hoses, and manifold assemblies. Evo promises to replace, at its determination, any product or component that is defective and covered under this warranty for as long as you, the registered original consumer-purchaser, owns the grill. explain seasoned grill. Is the grill stainless steel? Does it have tephlon coating? How thick is the grill? Hi, Jan. Evo grills have 1/4 inch thick seasoned steel cooking surfaces, which means that the cooking surface has a thin layer of oil that's been baked on. The oil layer creates a nonstick surface and protects the steel from rusting. However, this particular Evo grill has been upgraded with a ceramic coated steel cooking surface, which provides better protection and heat distribution than seasoned steel. The rest of the grill is made of 304 stainless steel.